Abby the Librarian: AudioSynced: February Roundup! Yes! It's that time again! Time to see what audiobooks everyone's been listening to in February! Did you review or post about audiobooks this month? Please leave a link in the comments and I'll add it to this roundup! Didn't post about audiobooks this month? No worries, we'll have another roundup for you next month. The Audies finalists were announced last month and Mary at Audiobooker has got the scoop. Are you reading Audiobooker? If not, you're missing out! 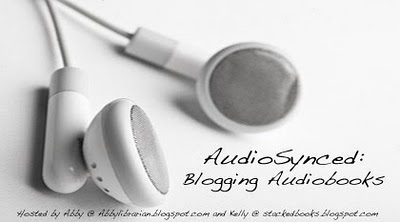 Mary posts about all things audiobook on her fabulous blog, so make sure you're tuning in. Barbara at the PW blog Beyond Her Book posts about some of her favorite audiobook narrators and what makes them so awesome. Winners of the 2010 Grammy Awards were announced last month. Check out the winners and nominees in the Spoken Word and Children's categories. And reviews! We have reviews! I reviewed The Secret Life of Girls by Frances O'Roark Dowell, read by Michele Santopietro. Of Santopietro's narration I said, "She has a strong, clear reading voice and though she does slightly different voices for the characters, hers is a narration that lets the story speak for itself. She does the story justice by not over-voicing or over-acting. It's a quiet kind of story and the simple narration really works for it." Don't forget to check out Audiobook Jukebox, a monthly collection of audiobook reviews around the book blogosphere (and another place to submit links to your audiobook reviews!). Melissa at Book Nut reviewed Odyssey winner The True Meaning of Smekday by Adam Rex, read by Bahni Turpin. She says, "Bahni Turpin did such an amazing job with the narration, that I know if I had read the book I would not have had as good of an experience with it." Lanea at Books for Ears reviewed the entire Sally Lockhart trilogy by Philip Pullman: The Ruby in the Smoke, The Shadow in the North, and The Tiger in the Well. Of the first book, she says, "It may not make much of a difference for some listeners, but for me his technique made the audiobook. In addition to his excellent accent and pitch work, his pacing and acting are wonderful throughout. The book was absolutely engrossing. I didn’t want it to end." Beth of A Foodie Bibliophile in Wanderlust also reviewed Odyssey winner The True Meaning of Smekday by Adam Rex, read by Bahni Turpin. She says, "I could not stop laughing the entire time. Much of that had to do with the masterful audio narration of Bahni Turpin." April at Good Books and Good Wine reviewed Tell Me a Secret by Holly Cupala, read by Jenna Lamia. She says, "I thought the audio was very well done. Jenna Lamia’s voice was perfect for the part of Rand. Plus, she gets the bitchy of Delaney so WELL. Then you can feel the condescension in her voice as she plays Rand’s mother. It’s wonderful and youthful and easy to fall into." Brenda at proseandkahn reviewed many audiobooks this month and her favorites were The Rock and the River by Kekla Magoon, read by Dion Graham (she says Graham "...turns in another winner, perfect timing, great voices.") and Skulduggery Pleasant by Derek Landy, read by Rupert Degas (she says "The performance by Rupert Degas was brilliant. I just loved his characterization of Skulduggery."). Lee at Reading with my Ears reviewed The Beans of Egypt, Maine by Carolyn Chute, The Big Burn by Timothy Egan, The Danger Box by Blue Balliett One Flew Over the Cuckoo's Nest by Ken Kesey, The Ring of Solomon by Jonathan Stroud, and Sapphique by Catherine Fischer. Lisa at Shelf-Employed reviewed Forge by Laurie Halse Anderson, read by Tim Cain. She calls Tim Cain's reading "[a]n excellent performance."